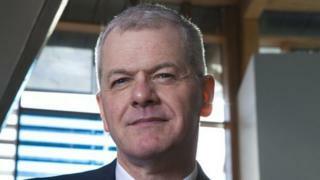 Efforts to improve England's education system are being undermined by short-term political pressures, according to former Ofsted chief Sir David Bell. Sir David, vice-chancellor of Reading University, wants strategy for schools to be set by an independent body. Political "firefighting" and shaping policy around electoral cycles has a destructive impact, says Sir David. It is a "ridiculous situation" for school curriculums to be based on "ministerial whims", he says. Sir David, in a speech to the Association of Science Education's annual conference, warns that constant political interference and policy changes are barriers to raising standards in school. A former permanent secretary at the Department for Education, Sir David says there should be no more major changes to the curriculum, qualifications or structural changes to schools during the course of the next Parliament. He wants an independent body to set long-term policy, separated from the shifting demands of party politics. This could create a qualifications system that would support a changing economy, he says, arguing that this would include replacing A-levels with a broader, baccalaureate-style exam system. Sir David also calls for more local autonomy for schools rather than "top-down tinkering and intervention" from ministers and civil servants. "The idea that academic excellence was only valued by a small coterie holed up in Westminster was as insulting as it was wrong," he says. The university head also criticises political interventions in higher education. "Too often it lacks rigour and a strong evidence-base. We can see that in the home secretary's bizarre suggestion to remove from the country bright foreign students the moment they graduate." He also strongly criticises the government's policy on teacher training as being driven by an "ideological fixation" with switching training away from university education departments, because they are perceived as "Marxist hotbeds". The emphasis on the "school direct" scheme, which promotes teacher training within schools, risks damaging university courses, he says. "Ministers need to take a more grown-up view of policy - not cut their noses off to spite their own faces." A spokeswoman for the Department for Education highlighted that there was already an independent exam regulator and that changes in qualifications drew upon expert advice. "Our plan for education will ensure all pupils leave education with the knowledge and skills they need to access a wide range of jobs and succeed in a competitive global market. "Our new science GCSEs and A levels were developed by experts - who drew extensively on views from higher education about the knowledge students need to prepare them for higher education." But Kevin Courtney, deputy general secretary of the National Union of Teachers, backed Sir David's call for less political interference in schools. "For far too long education policy has been driven by narrow political agendas, often ignoring all advice from the teaching profession. The government defines educational success in dangerously narrow terms, and punishes the teachers, schools and students who do not attain it." Russell Hobby, leader of the National Association of Head Teachers, said the school system needed better long-term planning and less volatility. "Education has endured a toxic mix of interference in the detail of teaching and neglect of the support schools need to succeed."